Classic Thai chicken dish made with coconut milk, galangal, kaffir lime leaves, lemongrass, and Thai chiles, that will blow you away. Serve it as a main dish with rice, or as a soup. See the notes section at the bottom for ingredient details and everything else you need to know. Serves 4 as a main dish, more as a side. 1. Bring the chicken broth to a boil in a medium pot (large enough to hold all the ingredients later). Allow it to boil with the lid off as you prepare the other ingredients, until it is reduced by about half. Remove any dried-out outer layers from the lemongrass and cut it into lengths of about 1 inch. 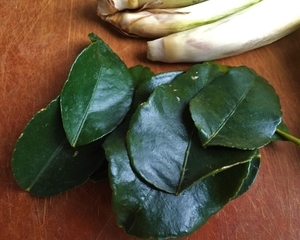 Remove the tough center stem from the lime leaves and tear them into small pieces. 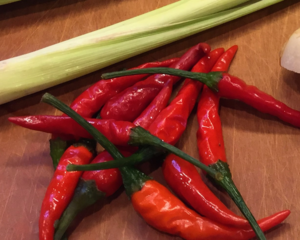 Use a mallet or heavy mug or glass to smash the lemongrass pieces and the chiles a bit to soften them and prepare them to infuse their flavors into the broth. 3. Turn the heat to its lowest setting and stir the coconut milk into the broth. Add the lemongrass, galangal, lime leaves and chiles and stir gently to combine. (If you're sensitive to heat, you may want to start with just a couple of chiles, adding more later if needed. I used 5 chiles, which I would describe as medium heat.) Turn the heat up to medium and adjust it as needed to allow the aromatic mixture to gently warm until steaming, but do not allow it to boil. 4. While the aromatics infuse into the soup, dice the chicken thighs into bite-sized chunks about 1 inch in diameter. 6. Stir the chicken and mushrooms into the steaming liquid. Allow them to poach for about 15 minutes with all the aromatics, until the chicken is cooked through and the mushrooms are tender. Adjust the heat as necessary to keep it steaming hot, but not boiling. 7. Remove the soup from heat and stir in the lime juice and fish sauce. 8. Taste the soup. You should taste 1) sour, followed by 2) salty, with a hint of 3) sweet from the coconut at the finish. And the whole thing should taste stunningly delicious. If needed, add a bit more lime juice or fish sauce, a splash at a time, until the flavors balance correctly. 9. Stir in the cilantro leaves just before serving. This dish is so delicious it should stop you in your tracks. It's got it ALL going on: salty-umami from the fish sauce and mushrooms, sour from the lime juice, sweet from coconut milk, and amazing flavor from all the aromatics. 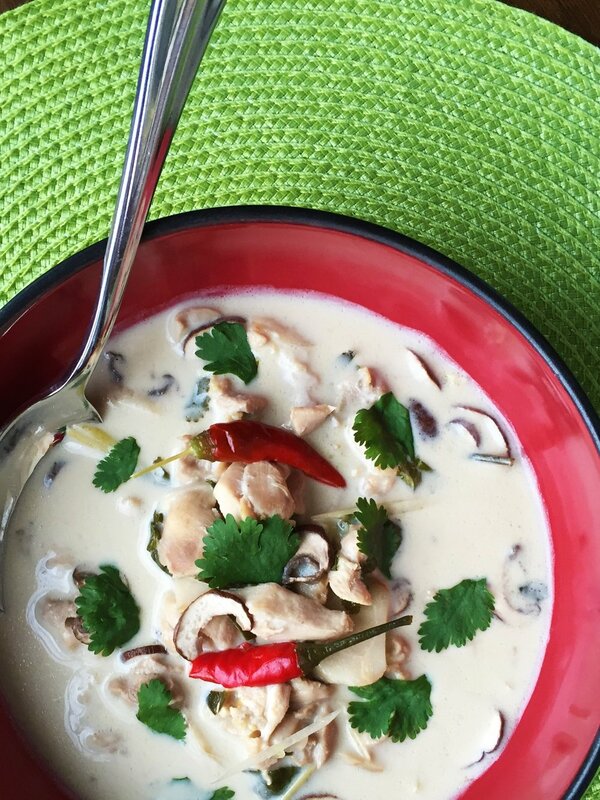 Tom Kha Gai translates to "boiled galangal chicken" so if you can find galangal, by all means do. I've never seen galangal or kaffir lime leaves in conventional stores near me, so in my neck of the woods, a trip to the Asian market (or Amazon?) is in order for this dish. 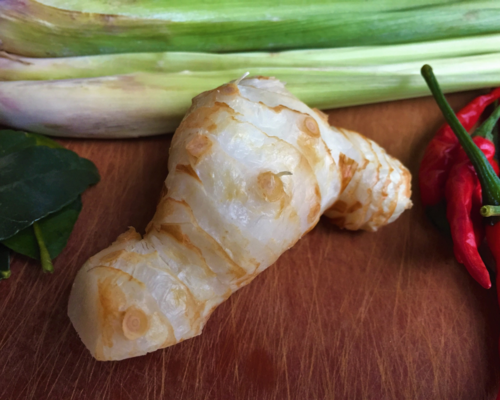 If you can't find galangal, ginger is a common substitute, though it's not really the same. This is traditionally a rustic dish made from a whole chicken, including the feet! Chicken feet are all about gelatin and flavor (not meat), so if you see some while you're at the Asian market, feel free to pick up a couple and drop them into the pot. In this recipe, the chicken broth is boiled down and concentrated to help make up for the lack of intensity that parts like chicken feet would add. If you want to include them, add them to the broth at the beginning, then either take them out just before serving or ladle around them. Two brands of coconut cream/milk from my local Asian market. I used the Savoy. 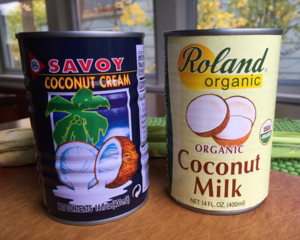 Coconut milk/coconut cream labeling and packaging can be confusing, so let me explain. It should be sold in a can (not as a beverage), and the label might say either "coconut milk" or "coconut cream." Regardless of which term they put on the front label, what's inside the can is some combination of coconut water (the liquid inside the coconut), coconut (or coconut "extract") and added water. The proportions of these can vary. For this dish, you want something that's creamy and coconutty, rather than mild and watery. And ideally, the only ingredients listed should be coconut or "coconut extract" and water. Other ingredients (emulsifiers, thickeners or stabilizers) are working to keep the coconut milk cohesive, and could affect the way it blends with the rest of the ingredients in the dish. I bought the two brands in the picture and ended up using the Savoy. It's imported from Thailand, is thick and creamy, and only contains the ingredients mentioned (Roland's adds guar gum, a stabilizer). Shake the can before opening it (or stir it afterwards) in case it has separated. Caution: do not use "cream of coconut" for this dish! It's sold under brand names such as Coco Goya or Coco Lopez, and it's a thick, heavily sweetened thing for use in pina coladas and other sweet drinks. NOT this dish. When you serve, leave the lemongrass pieces behind in the pot. They're in the dish to infuse flavor, not to be eaten themselves (they're too tough). If you happen to get a piece of lemongrass in your dish, just eat around it. You can serve this Thai-style as an entree, with steamed jasmine rice. Or you can serve it as a soup or side dish. Adapted from the recipe for Tom Kha Gai found at SheSimmers, the beautiful website of Leela Punyaratabandhu. Leela shares recipes and traditions from her Thai kitchen, using ingredients she can find in the United States.